Club Penguin Cheats by Mimo777 Club Penguin Cheats by Mimo777: Club Penguin Christmas Party FREE item! Today is December 16th and there is a new Club Penguin FREE item on the 12 Gift of Christmas in the Forest! 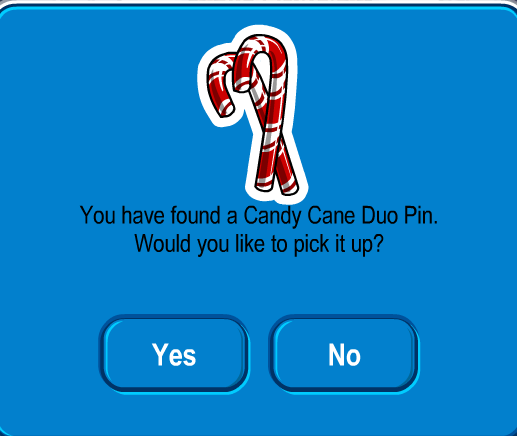 You now have the Candy Cane Duo Pin! Saweet! I was hoping for something more exciting than a pin. Mimo did you review the postcards yet?????? two things 3 books that i think are new in the book room & at the gift shop the trasure book is not there. Omg people, I can't believe non members are getting 12 free items at the party, and you still complain??? If you donate 10,000 coins straight up, in one transaction, you get the epic donation stamp.